Min Myat © 2009 John Gevers. Min Myat goes to work each weekday at 2:00 in the afternoon. He doesn’t drive and his job is 85 miles away, so he pays someone else to drive him. After working a shift at the Tyson meat factory in Logansport, Indiana, he is driven back to Fort Wayne where he arrives home around 3:00. In the morning. 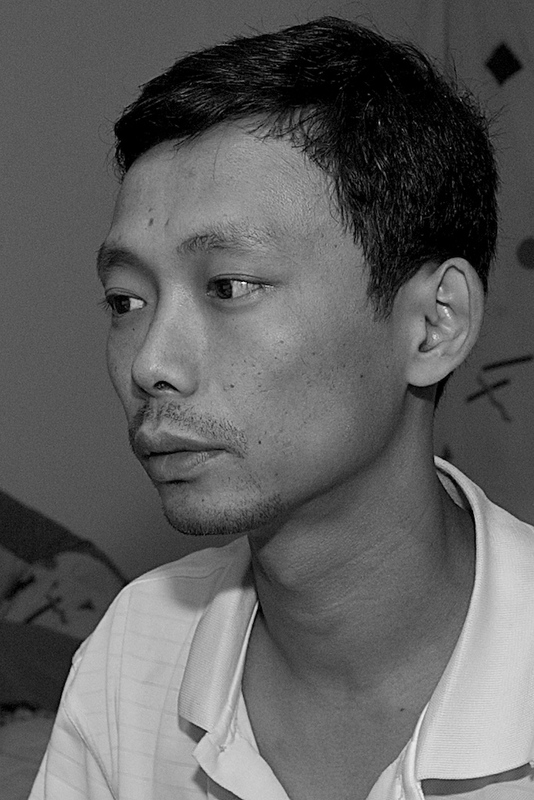 Despite his odd, long hours working in a pork production factory 1½ hours away, the 36-year-old Burmese refugee doesn’t grouse. Instead, he exudes a decided peacefulness. 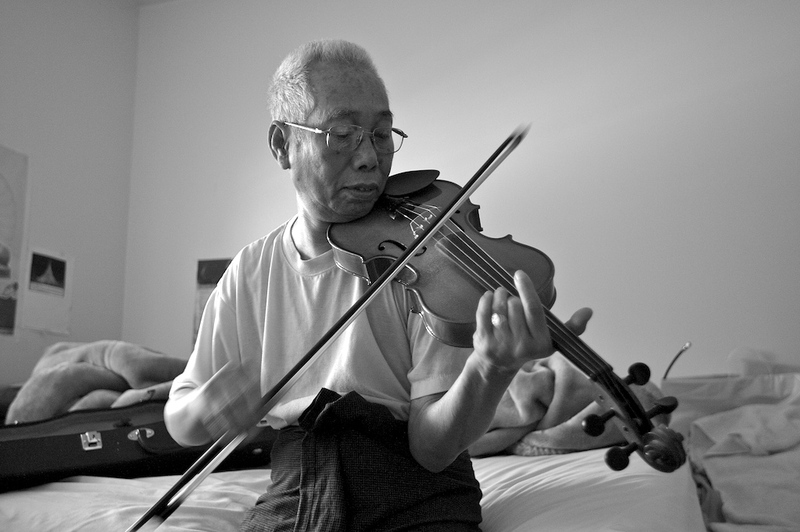 His elderly father, also a Burmese refugee who lives with his son and family, conveys the same gentle quietness and, in fact, often soothes the apartment with his violin playing. Min Myat's father, Mya Sein. © 2009 John Gevers. All rights reserved. In Thailand, his job paid the equivalent to $100 U.S. each month. Here, he earns $400 each week. He is thankful for the wage but points out that he did not pay taxes or housing costs where he lived previously. Despite the burden of having to pay those expenses now, he said he accepts it and feels life is better in his new country. He is no stranger to having to learn a new language to establish life in a new country. After he fled Burma and its military government in 1994 at the age of 21, he landed in neighboring Thailand. For the first year as a displaced person not speaking the native language, the best job he could find was in farming, plowing and cultivating vegetable plants. It proved to be very hard work for the strong-spirited, yet slightly built man, so he committed to studying the Thai language, hoping to find a different job. Min Myat. © 2009 John Gevers. All rights reserved. “I really wanted to learn the language so that I could help the Burmese people living inside Thailand. This was national politics, not party politics,” he said, making the distinction because he had fled Burma and the harsh treatment and party politics of its ruling military government. “I don’t like the Burmese regime because they are a dictatorship, and I have always been against the rule of a dictatorship,” Min Myat said. As a 15-year-old boy, he participated in Burma’s student-led August 8, 1988 (8888) democracy uprisings and demonstrations against the military regime. It ended just weeks later after thousands of demonstrators were killed fighting for the end to one-party rule. When the military put a bloody end to the demonstrations and took over state power, they ordered all Burmese families to go to labor concentration camps, Min Myat said. 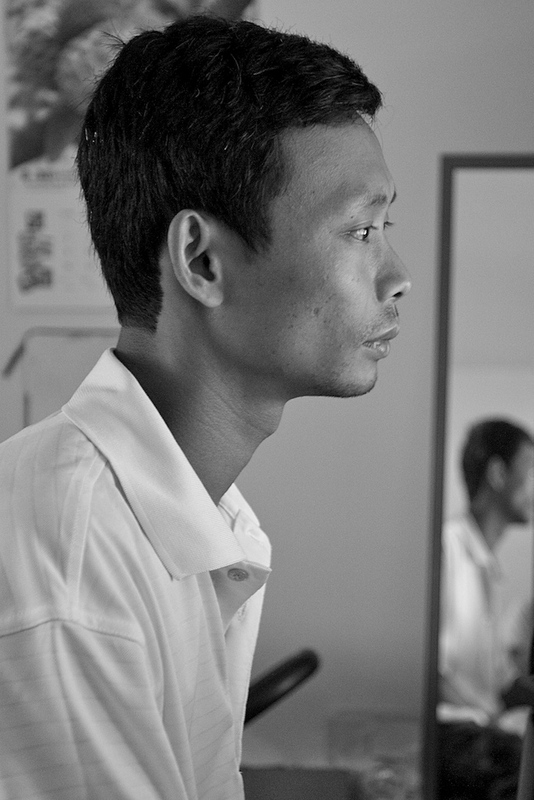 “They ordered me and my family to do forced labor inside Burma. There’s nothing we could do to deny this forced labor imposed by the military government,” he said. The government ruling Burma since that time is known as SPDC, which stands for State Peace and Development Council. They renamed the country Myanmar, a name most Burmese who have fled their homeland refuse to use. “Wherever the military government wants to build a new road or paint a new building, they order the Burmese to do the forced labor without any pay,” Min Myat said. “They are afraid that if Burmese people have free time, they will discuss politics and be against them. The military government also doesn’t have much money and, therefore, cannot pay for labor, so they exploit the Burmese people as forced labor,” said the man who now works hard and long hours at a distant job as he establishes a new – but free – life in a democracy. He wants only to provide for his family and ensure that his children receive a good education. Min Myat © 2009 John Gevers. All rights reserved. It’s sure I would be arrested one day. “The military government in Burma wants to show its power by ordering people to work for them for no pay,” Min Myat said. “And if you deny their orders, they will show you their power by arresting you. We were very against the military government, so the military was very much against us. I decided I could not live in Burma because if I lived there, it’s sure that I would be arrested one day.” A fate some of his friends and relatives have realized. After fleeing his homeland for Thailand and learning the Thai language, he organized a small group of people who assisted Burmese families living in the Thai refugee camps when they needed medical attention at health clinics and hospitals. Min Myat became an interpreter for his fellow countrymen in their temporary host country and made some money in the position he created for himself. He is quick to point out that the interpreter service also helped improve relations between the Burmese and the Thai clinic owners. Burmese refugees are given no legal resident status in Thailand and, therefore, tensions can run high between the races. By opening lines of communication, Min Myat played peacemaker. He went on to help establish a school on the Thailand side of the Thai-Burma border where many of the refugees live while enduring years of uncertainty — awaiting resettlement. And there’s no guarantee there will be resettlement options for everyone. Not many countries currently accept even limited numbers of refugees needing a safe new country to call home. Min Myat became a teacher in the school for 300 Burmese children refugees. In that role, he learned a bit of English — a skill he now needs to further as he starts yet another new life in a different country. He and his wife had their two children during the 14 years they lived in Thailand as refugees from Burma, but he fretted knowing their future was limited there. “Even I had no documentation, no residency permit, no citizenship,” he said. He and his family, like most other refugees, were living in limbo, barely carving out an existence with no real home and a doubtful future. He and his wife applied to the United Nations High Commissioner for Refugees (UNHCR) as political asylum seekers. That was 2004. They waited through four more years of uncertainty before being granted admission to the United States. Min Myat also reports being afraid of the Thai police because he and his family had no residence permit. “Thai police are the worst bribery-taking police in the world,” he said. Living room shrine to Buddha. © 2009 John Gevers. All rights reserved. Min Myat and his family are Buddhist and he finds comfort in the freedom to practice their religion where it’s a guaranteed right. He brought with him Buddhist teaching books and, in addition to attending the two Buddhist monasteries in Fort Wayne, he teaches his children his religion’s principles and impresses upon them the need to obey the teachings of the Buddha and of their elders and teachers. “Buddhism is a very ancient and flexible religion,” he said, and it provides an important touchstone for his family as they straddle far different cultures. 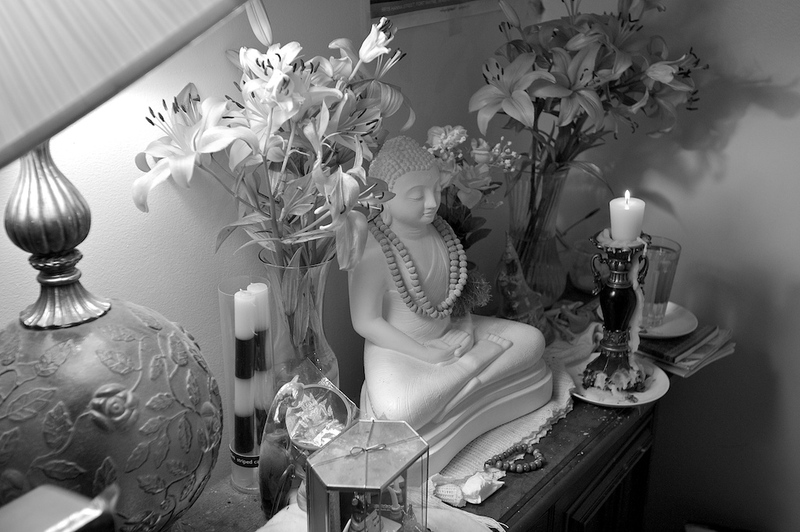 There is a shrine to Buddha in a corner of the apartment’s living room where a television set would be more likely. Min Myat’s father proudly showed prayer beads displayed around the family’s Buddha statue. They were made by cousins who remain inside Burma and inside prison for going against the ruling military regime. Mya Sein with prayer beads. © 2009 John Gevers. All rights reserved. Min Myat finds purpose in providing for his daughters and believing they will become well educated now that they’re living in the U.S. He is driven by knowing that he must work and save to pay their educational fees in the years ahead. He longs for the day when there will be change in the political system of Burma. And he envisions a day when he and his family can go back to their home country. You are currently browsing the Yearningtobreathefree's Blog blog archives for December, 2009.